Christmas is a time for family, gratitude, warmth and fun. We hope everyone had all that and more while celebrating Christmas this year. At INK too, the festive spirit was not missed with an office Christmas party, an innovative tree made out of a stepladder and Secret Santa to boot! This is how we celebrated our festival of giving, but we’d like to give you a small glimpse into how these 10 countries do it as well. As some say, the quirkier,the better! We usually hear kids hanging their stockings by the fireplace for Santa to drop presents, but kids in the France seem slightly more sophisticated. These guys leave their polished shoes by the window sill for Santa to place presents in! This tradition is also followed in Iceland. 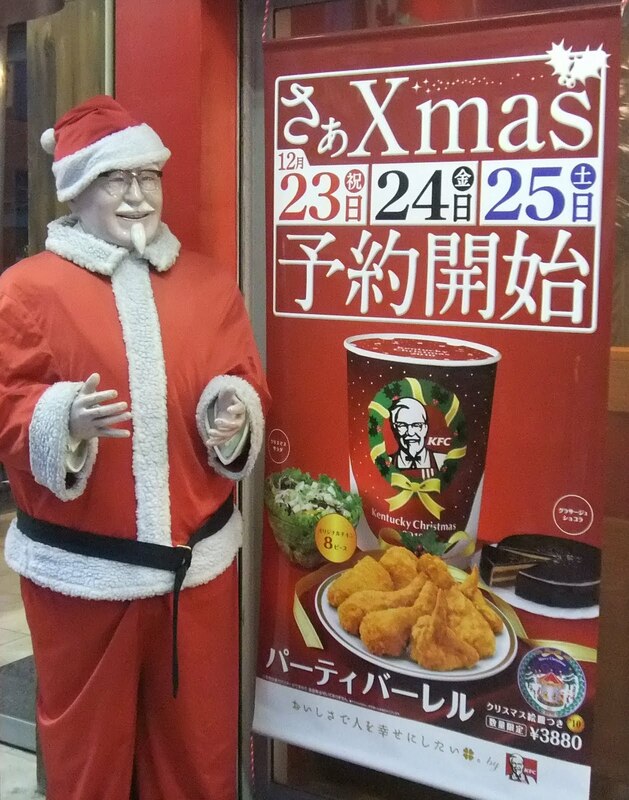 The tradition on Christmas day in Japan is to go get some chicken at the nearest KFC. This norm is thanks to a successful campaign run in 1974, which convinced many Japanese people that fried chicken is the way to go to celebrate this day! This country closes its streets to vehicle traffic on the eve of Christmas so that people can travel to church on roller blades. Apparently this tradition is quite enjoyed by high school kids! These countries have many, many people who swear by Christmas pudding made with Irish Whiskey or Guinness. It’s probably very safe to say that by the time the clock strikes 12 and Christmas dinner is over, they would all be in an extremely festive mood! The climate in India is decidedly not very encouraging for coniferous trees like fir and pine to grow. Some regions substitute Christmas trees with banana and mango trees. True innovation indeed! In Philippines, there is a special tradition of having a Christmas lantern called ‘parol’ made out of bamboo and paper. The lantern is star-shaped, like the Star of Bethlehem and can be seen in many markets around Christmas! This country, thanks to being in the southern hemisphere, enjoys a hot and humid Christmas rather than a White Christmas. The people here gather at beaches on Christmas day and try to beat the heat away! (along with singing Christmas carols to the background music of waves). The women follow an interesting ritual in Czech Republic on Christmas eve, to find out if they will marry in the following year. With their backs to the front door, they throw one of their shoes behind their shoulder. If the shoe lands with the heel facing the house, it means they stay single for another year. If the shoe lands with its front facing the door, it means they should start making plans to move out soon and plan the grand wedding! Norway has an ancient belief that witches and evil spirits lurk out on Christmas eve to steal brooms and ride the skies. To prevent this happening, all brooms and cleaning equipment are hidden away inside houses and men fire shotguns in the night to scare these creatures away! In Slovakia, on Christmas eve dinner, the head of the family takes a spoon of Loksa (a traditional Slovakian Christmas dish made of poppy seed filling, bread and water) and throws it up at the ceiling. The belief is that the more the gooey mixture sticks on the ceiling, the richer the man’s crops will be the following year!